One alternative to demolition for a country house whose time as a home had come to an end was conversion to offices. Many houses were thus saved from the wreckers pickaxe although some conversions were more sensitive than others, with some unfortunate houses being reduced to shells with the historic interiors severely compromised. Some were very successful such as Donington Hall (headquarters to BMI), Mamhead House (formerly HQ to a local construction firm but well looked after and now back as a home) and Gaddesden Place (now home to a software company). One such house which was converted in 1955 and in need of a sympathetic new owner is the grade-A listed Cumbernauld House in North Lanarkshire, currently for sale at offers over £1m. Built for the Earl of Wigton in 1731, the house was designed by William Adam (1689-1748), one of the leading architects of his day, and includes some of his typical flourishes such as arched windows, channelled masonry and carved tympana. Although the Adam interiors were lost in a serious 1877, the reconstructed interior is still noteworthy. Currently empty, this house deserves a new lease of life and would make a suitable and impressive headquarters – although part of me does faintly hope that someone might want to take on the challenge of turning it back into a home. 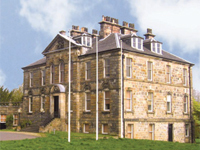 This entry was posted in At Risk, for sale, News and tagged architecture, At Risk, buildings at risk, country house, cumbernauld house, for sale, grade-a, heritage, lanarkshire, listed, offices, scotland, william adam. Bookmark the permalink.